From the U.S. Fish & Wildlife Service’s website. 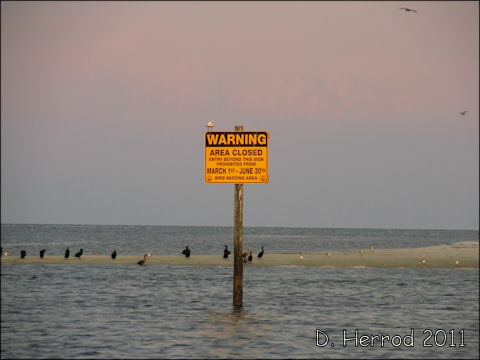 Cedar Keys National Wildlife Refuge was established in 1929 by President Herbert Hoover to protect a breeding ground for colonial nesting migratory birds during a time when market hunters, desiring feathers for the ladies’ apparel industry, were slaughtering millions of birds. Today, the threat is much different – coastal islands are being rapidly developed and habitat is lost forever. Congress strenghtened the refuge in 1972 when it designated four of the original refuge islands as National Wilderness Areas under the Wilderness Act. Presently, the refuge is comprised of 13 islands ranging in size from 1 to 120 acres and totaling 762 acres. The most recent addition to the refuge was Atsena Otie Key, which was purchased in 1997 by Florida’s Suwannee River Water Management District and managed as part of the refuge through a partnership agreement. Dee, I’ve desperately been trying to find information on the Free Church which seems to be the only one of its type in Sydney. Thanks for those American leads, I’ll keep searching. During the Reformation the Free Churches came out of the radical reformers who were not affiliated with government churches (Anglican, Lutherans, Presbyterian). They are closely related to the Brethren churches. The warning sign stands out against that darkish sky. I am satisfied, my love.